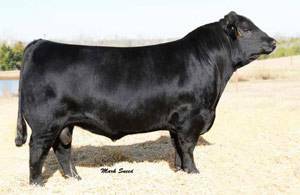 Salt Creek Bob is a performance based sire with excellent GENESTAR merit. He has an incredible 7 of the 8 possible QG stars. He's in the top 1% for QG, top 20% for Tenderness, and top 30% for Feed Efficiency. He also has great phenotype! Bob was named Grand Champion Bull at the Tri-State Fair, and he sired the Reserve Champion Bull.